Starting with September 2018, Vitalis hotels’ portfolio has been enriched with a new key project, a premium hotel, developed by Business Hotel Investment, member of NIRO Investment Group. This marks the first collaboration between our companies. The new hotel will be ideally located at Expozitiei Boulevard, a top area of Bucharest, nearby ROMEXPO International Exhibition Center, only 15 min from the city center and 20 minutes from Henri Coanda International Airport. Being one of the most significant new developments in hospitality sector in Bucharest, a luxury hotel of superior quality, it will be one of the highest buildings in Bucharest, having 85 meters height, approx. 30,000 sq. m of GBA on 23 above ground levels and 3 basements. The project is intended for both business and leisure tourists and it will offer to its future guests a modern, stylish design, cutting-edge technologies and a full range of luxury services. The hotel will comprise approx. 204 rooms and 17 luxury apartments, two restaurants, conference and festivities venues, shops, offices and parking area. Furthermore, the future hotel’s guests will benefit from exclusive services, such as spa and pool area and a high-class restaurant at the last floor of the building. Within this project Vitalis team was appointed to provide Project Management services, as well as Cost Management, Site Inspection and Health and Safety Coordination. The project is estimated to be delivered in Q4 2020. 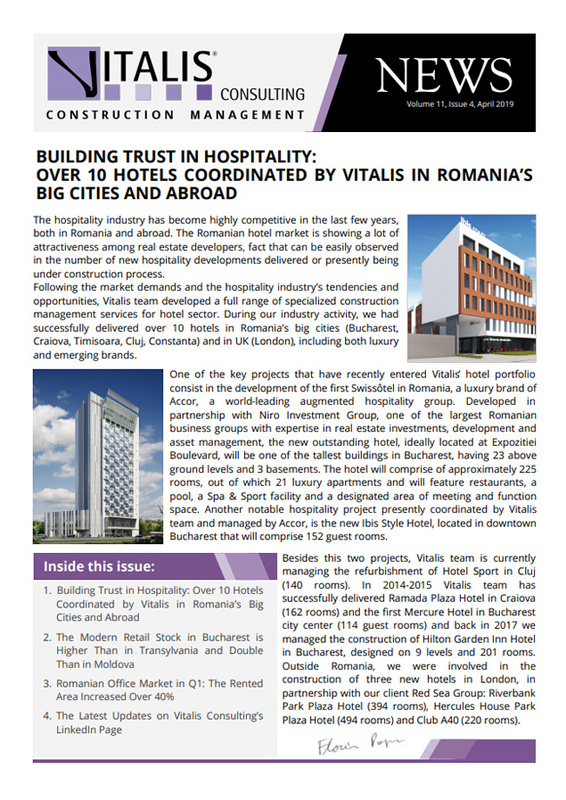 The hospitality sector has become one area of interest for investors over the last few years in Romania. 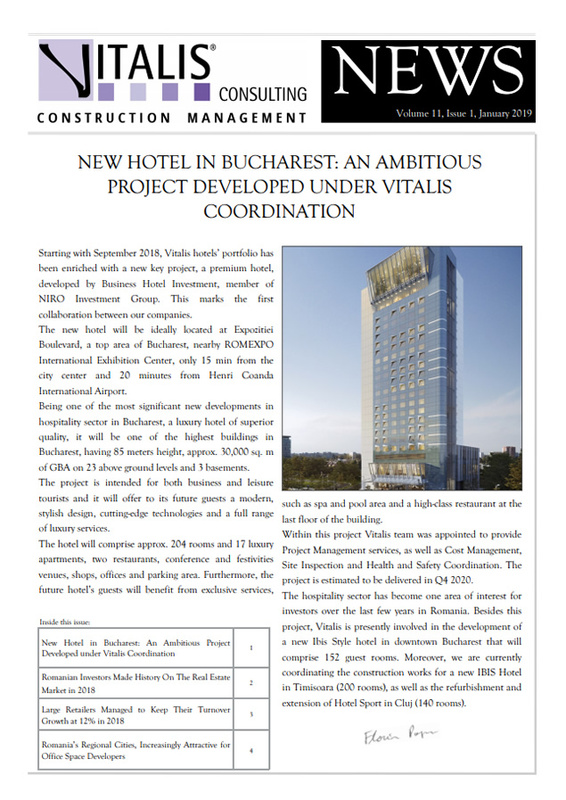 Besides this project, Vitalis is presently involved in the development of a new Ibis Style hotel in downtown Bucharest that will comprise 152 guest rooms. Moreover, we are currently coordinating the construction works for a new IBIS Hotel in Timisoara (200 rooms), as well as the refurbishment and extension of Hotel Sport in Cluj (140 rooms). The year 2018 ended with a significant premiere on the local real estate market: Romanian investors ranked second in the volumes generated by nationality. Almost EUR 200 million were paid to buy commercial properties (about a quarter of the total volume), a significant leap to more than five times their investment in 2017. The increased presence of the Romanian capital on the real estate market marks a possible turning point, because one of the observations we have received so far from some foreign investors without activity here was: if Romanians do not trust the local assets, why should we? At the same time, it is also a sign that the Romanian economy as a whole has grown so much in the last decade to lead to capital accumulation, a positive aspect for longer term prospects, according to real estate specialists. On average, in the Central and Eastern European economies, local buyers accounted for 23 percent of the business, so Romania approached the other countries in the region for the first time. Another observation would be that South African capital still dominates in Romania, with a share of almost one-third of the investment volume, double the share it has in the region as a whole. A second memorable event of the past year is that two of the signed deals are among the top ten largest real estate transactions. As per real estate consultancy experts, if Romania’s economy does not go too far from potential growth in 2019 (about 4 percent), and the global economy will remain in a relatively favourable dynamics, growth in the real estate market can also be seen. Last year yields in the Central and Eastern European capitals continued to decline, increasing the gap with prices in Romania. Thus, despite the more difficult economic context and higher uncertainties than a year ago, there are premises for 2019 to generate new positive surprises, and these two records recorded in 2018 could even be overcome. Large retail chains operating mainly in shopping centers maintained an average growth rate of 12% in 2018, similar to 2017 and double the advance in consumption, which increased by 5.9% during the first ten months of the year, according to a market study. The study examined the expansion and turnover growth of 88 retail companies operating stores under more than 100 international and local brands in FMCG, Fashion, Electro-IT, Cosmetics, Sports, Footwear, Kids and Toys, Jewelry, Food and Beverages, Home & Deco and Bookstores. The surveyed retailers had more than 5,054 stores at the beginning of 2018, and they expanded their networks by adding 487 new units over the year, compared to 522 openings in 2017. In regards to the financial performance, the cumulative turnover of these companies is estimated at 15.37 billion euros in 2018, representing a market share of almost 40% of the total estimated turnover of the retail sector. According to real estate specialists, the 2018 evolution shows that large retailers with tens or hundreds of stores continue to gain market share both organically and by expansion. Even if 2018 was not a breakthrough year in terms of deliveries of new retail space, and the few openings were also concentrated in the last months of the year, most retailers have found resources to grow based on wage increases and purchasing power, inflation and also online commerce. Compared to 2017, the pace of expanding retail networks has slowed down in most sectors, both due to limited space options and the continuation of the optimization process by a number of retailers. The largest turnover increases are expected for retailers selling children’s articles (39%), clothing (17%) and Home & Deco products (16%). Bigger regional cities like Cluj-Napoca, Timisoara and Iasi as well as smaller ones like Brasov, Constanta, Oradea or Sibiu are increasingly considered by firms seeking educated workforce and the office space market will develop accordingly. Bucharest has 2.7 million square metres of modern office spaces, compared to only 1 million sq. m in the regional cities, but the gap is narrowing, according to real estate specialists. For companies that need a skilled and educated workforce, these cities are a very good solution – they are university centres, people are well trained, and have decent income expectations [compared to Bucharest] while enjoying less busy traffic and the way of living here. Increased growth of regional cities also comes from the fact that companies find a better resource there. As regards other trends on the real estate market in Romania, we can outline the high dynamics in the demand for logistics spaces driven partly by the online commerce, embraced by the traditional retailers as well. In regard to the commercial spaces, the street shops lag behind the shopping malls simply because the public administration fails to deliver adequate public services (as opposed to the private managers of the shopping malls).